Drifts of grape hyacinths (Muscari spp.) rising like mist from the soil can only mean spring is on the way. Although blue grape hyacinths are the most common, the plants also bloom in white, yellow, pink or purple. Suitable for U.S. Department of Agriculture plant hardiness zones 4 or 5 through 8 or 9, depending on variety, the dainty bulbs multiply with enthusiasm. Massed beneath deciduous trees, they flower before the trees' leaves emerge spring. For the most impressive display, plant grape hyacinths where they have plenty of room to spread. As hardy bulbs, grape hyacinths need 14 or 15 weeks of temperatures between 32 and 45 degrees Fahrenheit to flower. Plant them early enough in the fall to ensure they'll get the required chilling period. Early fall planting also gives the bulbs time to develop root systems before the soil freezes. Plant them four weeks before the temperature stops rising above 32 degrees in your area. After that, it's too cold for the frozen soil to thaw during the day. Plant grape hyacinth where it will receive four or more hours of daily sun. Choose a location with well-draining, averagely fertile soil where the bulb can spread without encroaching on other plants. Small bulbs such as grape hyacinths display most attractively in groups of 50 or more. Space them 3 to 4 inches apart. 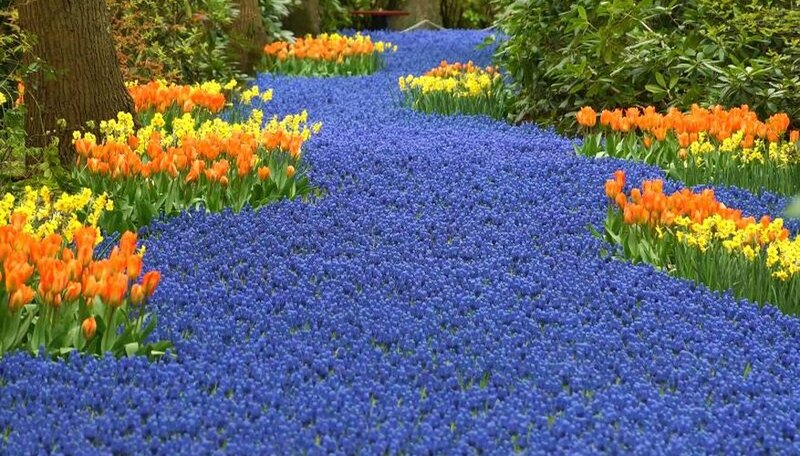 The biggest obstacle grape hyacinths face is poor drainage. To keep them happy, amend the planting site soil before planting with well-aged manure, compost or peat moss. Cover every 10 square feet of the planting bed with 1 to 2 bushels -- 25 to 50 pounds -- of the amendment and work it into the top 8 inches of soil with a spade or tilling fork. Don't skimp on the amendment; a generous amount keeps bulbs healthy for years. If the soil is loam or clay, dig the planting holes with a trowel; if it's sandy, use a specialized tool called a bulb dibble. Insert its pointed end 3 to 4 inches deep into the soil and work it back and forth to create a hole large enough for the bulb. Before planting, sprinkle the base of each hole with 1/4 to 1/2 teaspoon of 0-46-0 superphosphate fertilizer and scratch it into the soil so it won't touch the bulbs. Phosphorous -- the "P" in N-P-K fertilzer -- promotes healthy roots. Place a bulb with its pointed side up in each hole, leaving loose soil beneath it so its roots won't struggle. Replace half of the removed soil and water the planting bed well to settle the bulbs and add the rest of the soil. Unless the fall is exceptionally dry, don't water again before the soil freezes. Overwatering could lead to bulb rot. To preserve soil moisture and prevent frost heaves from lifting the bulbs during winter, cover the planting bed with a 2- to 3-inch layer of organic mulch. Wood chips or pine bark make effective choices. Grape hyacinth bulbs contain all the nutrients they need to sustain their first season of flowering.